Once upon a time, there was a piggy...with a comb. Polly is a lovable pig who just wants to do what she loves to do, and would rather play with her dolls than play in the Mud. With the encouragement of friends, Polly ends up starting her very own beauty salon, to help her friends feel unique and beautiful in their own special way. 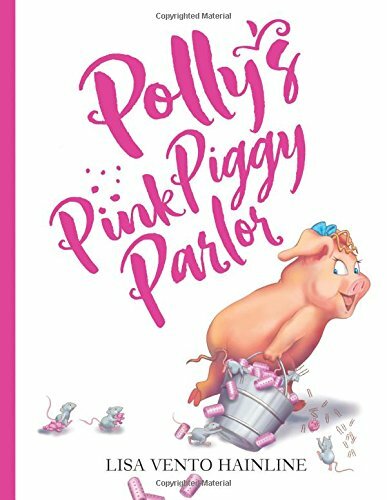 Polly's Pink Piggy Parlor encourages young girls to not only look their best but to discover what their talents and giftings are and develop them…no matter what anybody thinks. Polly is a most unusual pig. Instead of the usual mud play, Polly prefers to brush her dolly’s hair, and fix the coiffeurs of other farmyard and zoo animals. She helps her barnyard friend Sally who wants to be “hip” for her trip to town and encourages Polly to practice her talent. No creature was too difficult to beautify – from a fly to an elephant, Polly used her gifts, pampering the animals with their special requests, dyeing, plucking, curling, and even nail/claw treatments. She became so well known that she started her own beauty treatment parlor, the culmination of her hard work and dreams. The story encourages readers and listeners to follow their hearts and work to achieve their goals. Charmingly illustrated in shaded pastels, Hainlines a/a, b/b, c/c, d/d rhyme scheme will be sure to have kids begging for another read. Accompanied by an outline coloring book, youngsters can color along while listening to their favorite reader. A unique addition to the story is “finders keepers,” a counting list of specialty items found in the illustrations to help Polly put her shop in order. Printable activity papers are available free to download from the author’s website, http://www.lisahainline.com/. Lisa Hainline is an award-winning and gifted graphic designer, art director and illustrator, producing/directing for ad agencies, major corporations, radio stations, hospitals, banks, manufacturers, magazines and other small boutique businesses. With over 40 years in the advertising industry, for the past seven years, Lisa has turned her focus to helping other authors self-publish their works, designing some of the covers seen on Amazon. You can see her book cover design work at her studio www.lionsgatebookdesign.com, where she merges her design and marketing experience with her spiritual gifts to help Christian authors promote the message God laid on their hearts. Founder and author of http://www.thehealingsource.org, Lisa also ministers to the hurting through her blog, articles and praying with others in street ministry. Welcome to Avalon, a Renaissance Faire where heroes of legend never die. Where the Robin Hood walking the streets is truly the noble outlaw himself. Where the knightly and wizardly players of King Arthur’s court are in fact who they profess to be. Where the sense of enchantment in the air is not mere feeling, but the Fey magic of a paradise hidden in plain sight. 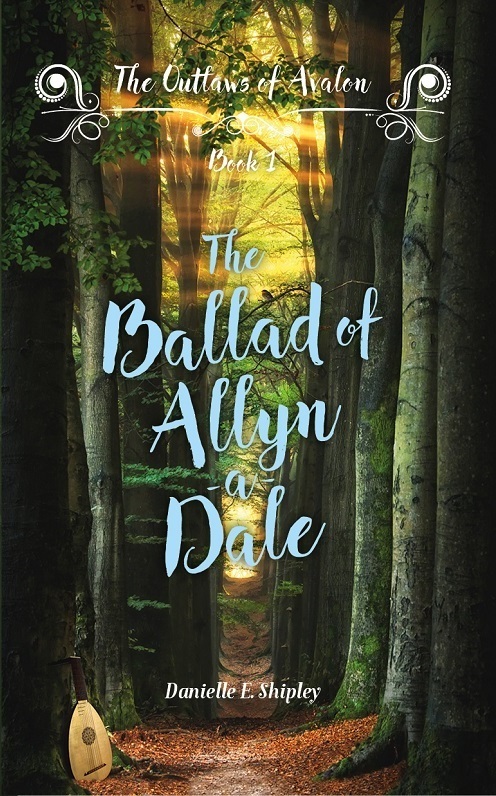 Enter Allyn-a-Dale. The grief of his father’s death still fresh and the doom of his own world looming, swirling realities leave the young minstrel marooned in an immortal Sherwood Forest, where he is recruited as a member of Robin Hood’s infamous outlaw band. 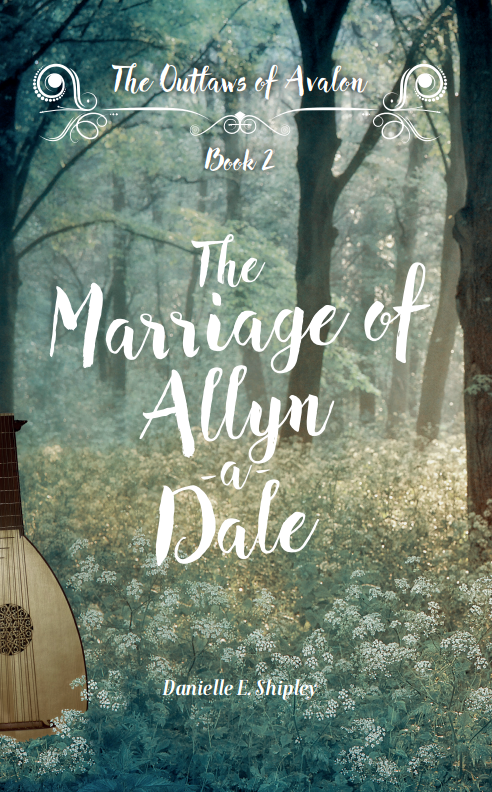 But Allyn’s new life may reach its end before it’s scarcely begun. Their existence under threat, the Merry Men are called upon to embark on a journey to the dangerous world Outside – ours – on a quest which must be achieved without delay, or eternity in Avalon will not amount to very long at all. I wanted to read this book ever since the words "Renaissance Faire" hit me. Add Robin Hood to it, and you hooked me. Shipley's Ren Faire happens to be the one I've visited several times, so the added bonus of physically being with the characters when they weren't out figuring out how to maneuver in the modern world, was extra fun. Shipley's fantastical tale is a combination fan fiction meets Neil Gaiman fantasy as her characters are borne of other worlds, times, and places. They live, love, and die (or sometimes not) in worlds they visit through mysterious portals and contend with those who dwell there. What would it be like to meet Merlin the magician, and play online games with Guinevere, who fancies herself quite a racer? Or know Maid Marian and the secrets of her heart? If these characters transcended time and came to live at a Renaissance Faire, and were tasked with saving the faire and all the Fey folk who make it their magical home, what would you give to meet and interact with them? Young Loren and Janey, visitors to the realm, can only guess as medieval times fantasy meets twenty-first century reality and the Merry Men do indeed make merry while they chase after the stolen Excalibur's sheath, which holds their fate. Who better to find a stolen object than a thief? 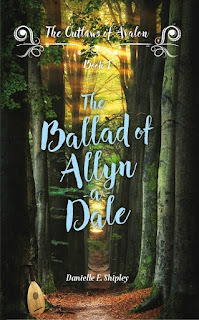 Told from multiple viewpoints, though mostly from Allyn's perspective, readers who don't mind mixing their folk tales with fantasy and a romp through the current era, will enjoy this fun tale. Shipley uses "Stanzas" for chapters, creating a wonderful frame for a minstrel's story. Action, adventure, and a twist of fun. Read the Interview with the Author here. 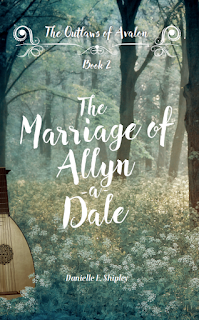 Outlaws of Avalon 2 (The Marriage of Allyn-a-Dale) released this past March; Outlaws 2.5 – a flash fiction collection right up a word nerd’s alley – is scheduled to launch in July; and the trilogy proper concludes this fall. I’ve saved the most emotional ride for last, so hold onto your hankies, readers! And if anybody wants to talk books with me in the meantime, feel free to hit me up on my website, deshipley.com. Danielle E. Shipley is the author of the Wilderhark Tales novellas ("Tales of magic. Tales of adventure. Most of all, tales of true love. Once upon a time, you knew them as fairytales. Know them now as Wilderhark's"), the novel Inspired, and several other expressions of wishful thinking. She has spent most of her life in the Chicago area and increasing amounts of time in Germany. She hopes to ultimately retire to a private immortal forest. But first, there are stories to make. When a struggling author with a secret government past is hired by a wealthy philanthropist to investigate a cold murder case, he has no choice but to expose the dark and buried secrets of a powerful political family in Chicago. Sebastian Drake is a novelist working out of a dilapidated apartment in the city who’s trying to come up with his next story idea. But he’s stuck. Drake receives an unexpected visit from a man interested in hiring him for a project and who thinks he has just the solution to Drake’s writing challenges. He also thinks that Drake’s past and secret life with a shadow government organization is a valuable asset. His proposition to Drake is simple: become a hired agent to investigate a cold murder case involving one of Chicago’s most powerful political families. The job comes with a decent paycheck, all the support he might need, and the types of real life experiences that can form the basis for great fiction stories. This is a story about a man with a new lease on life, who leads a dual existence. Behind his desk, he is an aspiring author. On the streets, he is a rogue undercover and unknown vigilante. His biggest challenge is keeping intact the fine line between reality and fiction. The premise of Burns’s thrilling detective story grabbed my attention. Sure, Sebastian Drake is almost a Sam Spade pulp-alike, a forties-era anti-hero for today, but honestly, how can you not love the wounded but capable man-of-few-words detective with a soft spot for his family? Who’s also an author! Drake’s initial success has not led to the subsequent best-seller notice he needed to survive in the authorial world. His agent dug deep and found a contract for a book he has yet to complete. Time’s running out and he’s desperate. Unlikely help comes through his former secret life. His shadowy employer knows things Drake would rather not remember, but Drake is fascinated by the request to dig back into a long-cold mystery. Drake’s hefty financial reward for a little detective work isn’t necessarily the main attraction to get his hands dirty once again. He’ll hopefully reap the material he needs to finish his novel—if he survives. Combing his acquaintances for help and returning to the scene of the crime as well as revisiting the original police files is not quite like old home week. Enemies and friends are suspiciously hard to differentiate. Drake slowly peels off layers of dust as well as fresh scabs from wounds both professional and personal, until the answers are bared. Told through Drake’s perspective, readers are pulled into a side of Chicago off the tourist trail. 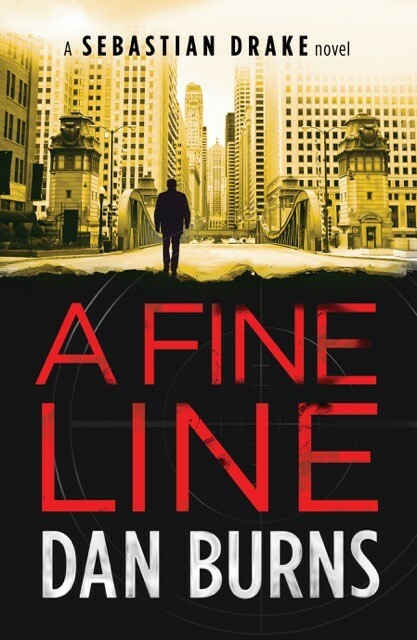 A Fine Line is a tale of winners and losers, and the chance to move forward and find both retribution and redemption. Those who enjoy detective adventures, particularly set in a familiar town, will find much to like about this novel. Dan, what do you love about this book? What I love most about this book is the path I had to take to see the novel come to fruition. My protagonist, Sebastian Drake, appeared first in a short story, Letting Go, which I wrote back in 2012. My process for the story was simple: put him at a table in a coffee shop, have him meet a person from his past, and see what happens. When I finished the story, I learned a little about Drake—who he is and where he came from—and I thought that was the end of his story. But Drake would not leave me alone. He had more to say and forced me to develop his story further. So, I went back to work and wrote a screenplay for a feature film that put him in the middle of a cold murder case in Chicago. The process was exhilarating and fun, and again, I thought that was the end of the story. The screenplay received national recognition and won the Best Screenplay Award at the Naperville Independent Film Festival, and fans at the festival asked, “What’s next for Drake?” I thought about the question often, and it seemed to me that the story I told in the screenplay was not quite complete. I could not get the story or Drake out of my mind, so I forged on and developed the story as a novel. I love the book and the story, and through the process, I came to the realization that Sebastian Drake is a part of me. He’s taking the lead now, and his story is just beginning. Where he will take us is anybody’s guess. Congratulations! What a great way to find a story. Introduce us to the character you had the most fun creating. I had the most fun creating Sebastian Drake because he needed to be a complex, conflicted, and sympathetic character. He also had to be different, with character traits, experiences, and skills that we haven’t seen in other mystery series characters. I feel I accomplished that objective. However, I also feel I’m just getting to know who he is and what he can become. He’s not a typical protagonist or hero—he’s really an antihero, since he lacks the conventional attributes of a heroic character. Drake continually walks the fine line between the past and the present, right and wrong, and reality and the fiction he writes. His life is an endless high-wire act, and there is no safety net. In a mystery novel, there has to be a nasty character, an antagonist, and in A Fine Line, there are many of them. But I especially enjoyed developing the character of Jerry Fitzsimmons: “an older man, thin and gaunt, almost sickly looking.” “He’s always grinning, like a cat who just ate a mouse.” From his “thin lips pressed together like a cadaver” to his “yellow teeth,” I found I disliked him more with each sentence I wrote about him. He gives me the creeps, and he adds a necessary dimension and complexity to the story. Fortunately, Drake doesn’t care much for him either and effectively addresses all of Jerry’s issues. Those are fun characteristics put together in a believable way! Share two things you learned either researching or writing-related during the production of this book? 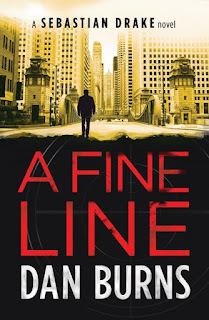 A Fine Line is a murder mystery set in Chicago. To make the story interesting and believable, I felt it was necessary to make the city a character and include details about the city that would pull the reader in, whether local or not. I grew up on the North Side, but the story had to take place in and around areas I didn’t know about, where I haven’t been—unknown places, darker places. The Chicago Police Department also plays a large role in the story, and I had to make sure I understood the hierarchical structure of the organization and the basics of police procedure, especially because there’s at least one character who doesn’t follow procedure. In researching both topics, what I learned is that even though I have lived in the Chicago area for fifty-four years, there is so much I still don’t know. I find that realization fascinating. There’s always more to learn and experience, and I think Sebastian Drake will make sure my education continues. Readers--take this and run with it! Explore your own community. Dan, what's next for you? I’m always juggling several projects. I recently completed a stage play script, Grace, and I’d love to produce it at a Chicago theatre. I am also continuing to write short stories and hope to have another story collection ready for publication next year. And Sebastian Drake continues to pester me. He has another story to tell, and together, we’re in the process of figuring out what that story is. And I'm looking forward to seeing what trouble Drake gets into next. Thanks for sharing about you and your work. Dan Burns is the author of the novels A Fine Line and Recalled to Life, and No Turning Back: Stories, the short story collection, He is also an award-winning writer of stories for the screen and stage. He resides with his family in Illinois and enjoys spending time in Wisconsin and Montana.